A unique platform to pitch your scripts and stories directly to movie producers! 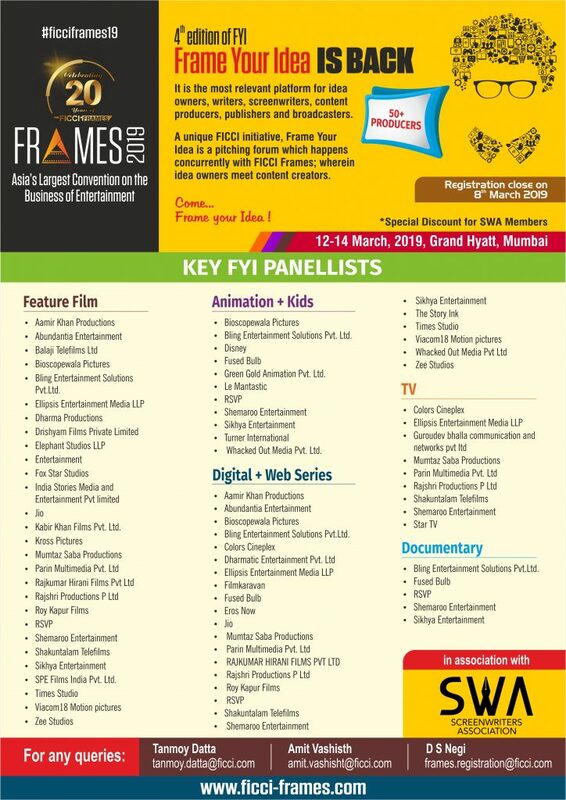 The 4th edition of ‘Frame Your Idea’, a pitching platform by FICCI-FRAMES for content producers to meet content creators; is scheduled to be organised in association with SWA on the sideline of the 20th edition of FICCI-FRAMES, on March 12-14, 2019. Frame Your Idea, has in attendance the top studios, broadcasters, producers who would have their content teams looking for that next big idea they would want to grab, develop and put out there. The program aims to provide, a unique opportunity to creative minds to pitch their ideas, stories or scripts to leading content producers. For the content producers, FYI endeavours to provide an environment to find fresh creative works and minds, that may typically not be able to reach them. An FYI participant gets a minimum of 4 slots to pitch, according to the submitted panelist preference on FIRST COME FIRST SERVE BASIS. Kabir Khan Films Pvt. Ltd.
SPE Films India Pvt. Ltd. The Screenwriters Association encourages all its members to make use of this one of a kind opportunity to writers to pitch their stories to over 50 production houses, film studios, TV channels and OTT platforms. Don’t forget to register your stories and screenplay with SWA before you pitch them. DISCLAIMER: It is understood that under no circumstances the Screenwriters Association (SWA) shall assume any responsibility for or obligation or duty with respect to any part or all of the Frame Your Idea program (organised by FICCI-FRAMES), of any nature or kind whatsoever, or any matter or proceedings arising out of or relating thereto. SWA shall not be required to take any action of any kind to collect or protect any interest of its members in relation with Frame Your Idea program (organised by FICCI-FRAMES), and in no event shall SWA be liable to its member or members for any loss of intellectual property, anticipated profits or other consequential, special or indirect loss or damage of any nature arising at any time, whether arising under contract, tort (including negligence), strict liability or dispute situation or for any other cause whatsoever. However, SWA members can always approach its Dispute Settlement Committee (DSC) with their grievances, if any, related to Copyright infringement, credits and remuneration. This entry was posted in Notices on March 2, 2019 by SWA Editor.